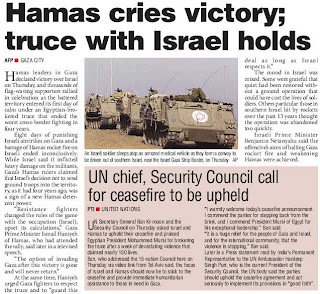 In the end, it was the Egyptian President Muhammad Morsi of the Muslim Brotherhood, with long-distance telephone calls from President Barack Obama, with US Secretary of State Hillary Clinton’s presence, that led to a ceasefire agreement on Gaza. 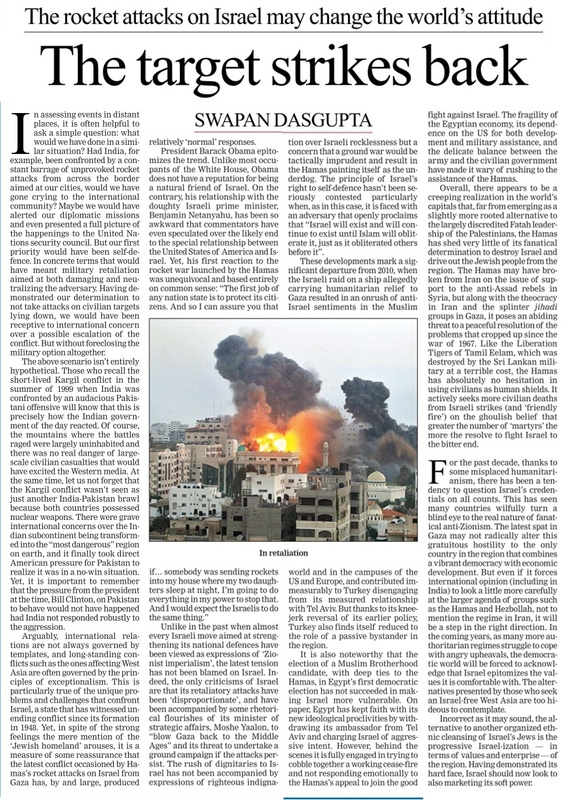 The diplomatic victor by a long shot is the Hamas movement because it forced Israel to recognise its inhuman imprisoning of a whole population for the last six years. Assuming the ceasefire will hold, it can be only the beginning of a long and difficult process. Israel’s decision to escalate its simmering crisis with Hamas in the Gaza Strip in answering rockets with massive bombardment of the Strip by US-supplied F-16s after killing the Hamas military chief has a cost. More than 140 Palestinians have died, including many women and children, as opposed to six Israeli deaths. It caught the Arab world in an interesting time of their history. Flushed with a sense of victory as the Arab Spring toppled President Hosni Mubarak, Mr Morsi won the presidency in the first free elections in Egypt. Even as he set about tackling his country’s endemic problems, exacerbated by the turmoil of the anti-Mubarak uprising, Israel’s Prime Minister Benjamin Netanyahu sprang him the nasty surprise. Hamas is a more extreme offshoot of the Muslim Brotherhood and Egyptians have a natural empathy for the suffering of the Palestinians locked into a strip of territory classed as the most crowded in the world. After Hamas won the election over the mainstream Fatah of the Palestine Liberation Organisation, Israel virtually imprisoned its people by a total sea blockade, a land blockade with only one crossing at Fatah policed by the Egyptians subject to Cairo’s moods and compulsions. It is no secret that the ingenious Hamas supporters built a system of elaborate tunnels to bring in essential supplies as also quantities of arms. Israelis frequently bomb these tunnels but there are simply too many to bomb. Israel and its main paymaster and monetary and military supplier, the United States, have been banking on the peace treaty with Tel Aviv through its mediation by returning the Sinai Peninsula to Cairo making the Jewish state safe. The conventional wisdom has it that Arabs cannot go to war with Israel without Cairo. President Mubarak, the long-time President of Egypt, was the inevitable mediator as and when Palestinians and Israelis came to blows, with Israelis showing off their high-tech military muscle against crude rockets from the Hamas side. Egypt, of course, was keenly aware of the American largesse offered every year in the form of $ 2 billion, mostly in military supplies, in addition to Washington’s support for aid to the country through multilateral agencies. For President Morsi, it was a nightmare scenario. His country desperately needed American money and support even as his people rose as one man for Hamas, whose supporters were being killed every day by Israel’s war machine. There was a massive demonstration in Tahrir Square and a new enfranchised people of the Arab world were up in arms. Even as prospects of a ceasefire multiplied, with the US reflexively offering full support to Tel Aviv, President Morsi has had to enact a Houdini act. It was striking that President Obama, reacting to events in Bangkok, gave full support to Israel while not having a word of sympathy for the scores of Palestinians in Gaza dying from Israeli bombs. The popularly elected President of Egypt was strong in his condemnation of the Israelis. He sent his Prime Minister to the Gaza Strip to meet the territory’s Prime Minister (in offices that were to be reduced to rubble by Israeli warplanes a day later) to express his country’s solidarity. Such rhetorical support yielded no offers of material help. 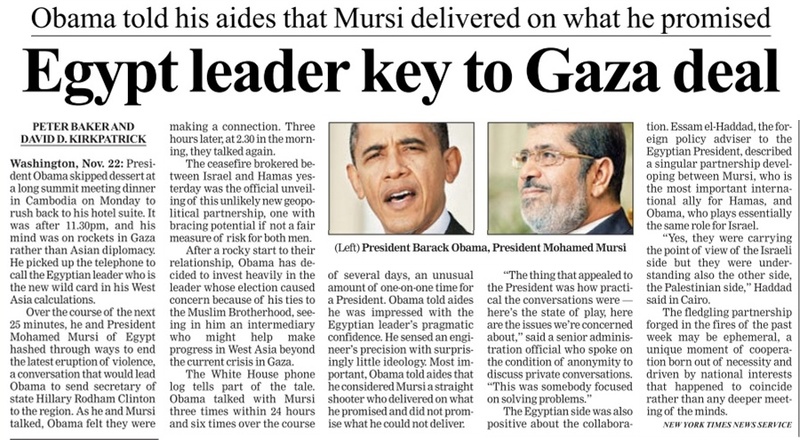 At another level, President Morsi was busy seeking a truce, with Israeli and Egyptian intelligence officers talking things over in an old network honed by Mr Mubarak and manipulated by the US. It is, indeed, a high-wire act which succeeded as Israel rethought its option for a land invasion, repeating its less than successful act four years ago. 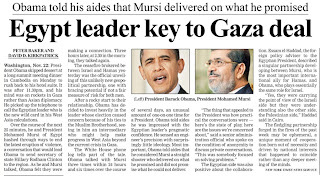 And President Morsi could well have done without the praise of Israeli President Shimon Peres for his efforts. Israel might have administered an old medicine, but the region has changed dramatically over the last two years as Tunisia lit the spark that spread in the Arab world like a prairie fire swallowing up long-time dictators in Tunis, Cairo and Tripoli and singeing Syria’s President Bashar Al-Assad. 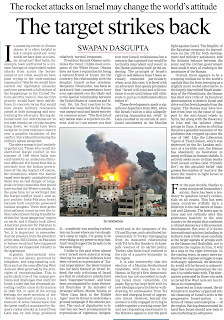 The outrage on the Arab street grew each day even as Israel arrogantly continued to colonise occupied Palestinian land and the holy city of occupied East Jerusalem, with a US President captive to the American Jewish lobby watching on the sidelines. If Israel continues along its present path of making a two-state solution impossible by cocking a snook at all cannons of international justice, thanks to Washington’s total support, the peoples of the Arab world would make life impossible for their popularly elected leaders. There were already calls made during the first public anti-King demonstrations in Jordan for revoking the treaty with Israel, the only other Arab country that has signed a treaty with Tel Aviv. There was speculation in the capitals of the world that Prime Minister Netanyahu was showing off his military muscle with an eye on the forthcoming elections in his country because bashing Palestinians and other Arabs is a popular pastime in Israel. What is of greater significance is that the Arab world has changed and is changing and old formulations of bribing and intimidating the region will no longer work. President Morsi has succeeded in walking the fine line between expressing support for Hamas while pleasing Washington by mediating in the latest conflict, but his dilemmas will remain. Even if the blockade is partially lifted in terms of the ceasefire agreement, Israel can expect more trouble as long as it remains in possession of occupied territory and acts as the regional policeman. This presents a larger dilemma for the American political system. Since the British left the Middle East, as the world calls it, and Americans took on, the American Jewish lobby has had a hammer-lock on the US Congress and Senate. In the American political lexicon, Israel can do no wrong. It is the highest recipient of American aid followed by Egypt. And for President Morsi and others of the newly-minted democratic credentials, there will come a point when their peoples will simply rise up against the continued colonisation and suffering of the Palestinian people. Ahead of the fourth anniversary of the 26/11 Mumbai terror attacks, activist-turned-politician Arvind Kejriwal today alleged that some of those who fought Pakistani terrorists in Mumbai were leading a “pitiable” life. They had not been adequately compensated or given financial benefits for the injuries suffered during Operation Black Tornado, he said. 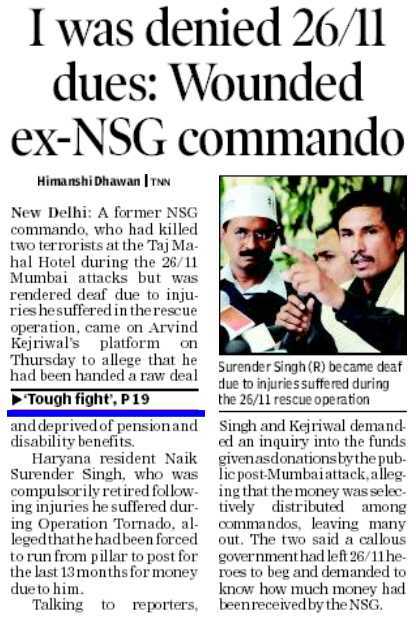 He presented before the media a former NSG commando, Naik Surender Singh, who was injured in the attack and invalidated from service in October 2011 after he became medically unfit. Singh claimed that he had not been given pension and dues that were promptly rejected by the government. Later, the Ministry of Defence issued a statement, saying the government had taken all care to pay the entitled terminal benefits due to Singh. It said Singh had been sanctioned pension and terminal benefits vis-a-vis retirement gratuity (Rs 2,11,458), Commutation of pension (Rs 11,35,809), Armed Forces PF (Rs 6,48,195), Army Group Insurance (Rs 1,13,849) and Army Group Disability Cover (Rs 10 lakh), final settlement of accounts (Rs 89,705) and ex gratia from welfare fund (Rs 10,000). “He is also entitled to an ex gratia of Rs 9 lakh for 100 per cent disability, which will be processed separately. 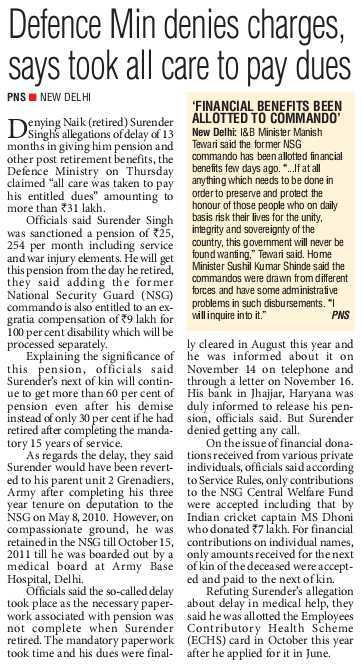 He has been sanctioned a pension of Rs 25,254 per month, which includes service and war injury elements,” it added. Naik Singh had suffered acoustic trauma and become a permanent “low medical category” on account of sensory neural deafness of the left ear. 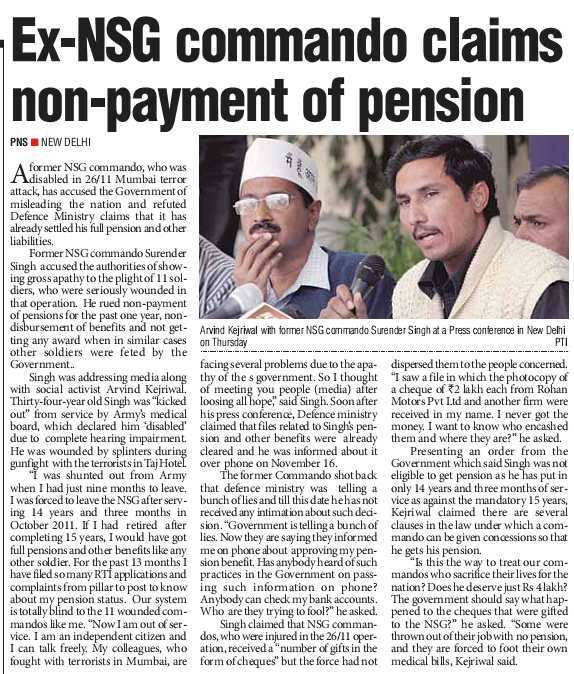 Singh claimed that he had not received a “single paisa” from the government in compensation for the injuries he suffered apart from usual retirement benefits. NEW DELHI: Strongly refuting allegations made by India Against Corruption (IAC) and Naik Surender Singh, the government on Thursday said the former NSG commando had in fact already got the bulk of all his dues while the remaining were in the pipeline. Though the defence ministry and the Army accepted there was considerable delay in Singh getting his benefits, they argued this was because he was "invalidated" out of service on October 15 last year after a medical board - which held him to be "a permanent low medical category on account of sensory neural deafness of the left ear" — and his paperwork could not be completed and processed in time. "The government has taken all care to pay all entitled terminal benefits due to Singh. In all, he has already got around Rs 19 lakh and is due to get another Rs 12 lakh. 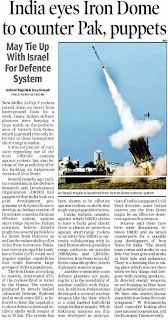 But in case, he still has any grievance, MoD is prepared to look into it," said a senior official. But what about Singh's claim that he was not allowed to complete 15 years of service so that he could become eligible for service pension? "He is, in fact, getting much more monthly pension now. 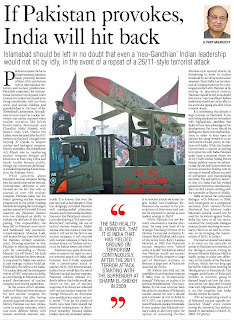 It amounts to Rs 25,254, which includes both service and war injury elements," said an officer. "Moreover, if he had completed his terms of engagement (15 years) and then proceeded for pension, he would not have got the Rs 10 lakh disability cover (already paid to him) and the Rs 9 lakh ex-gratia lump sum compensation for 100% disability (being processed)," he added. The defence authorities did agree that Singh's pension payment order could be processed and intimated to him and his bankers only on November 14-16 this year. 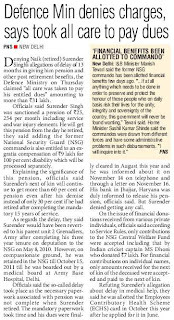 "He will, of course, get the pension arrears from October 16, 2011," said the officer. Giving a breakdown, MoD said Singh has been sanctioned pension and terminal benefits as follows: retirement gratuity (Rs 211,458), commutation of pension (Rs 11,35,809), Armed Forces Provident Fund (Rs 6,48,195), Army Group Insurance (Rs 1,13,849), Army Group Disability Cover (Rs 10 lakh), final settlement of accounts Rs 89,705 and ex-gratia from welfare fund Rs 10,000. "He is also entitled to an ex-gratia compensation of Rs 9 lakh for 100% disability, which will be processed separately. Plus, he has been sanctioned a pension of Rs 25,254 per month," it added. As for Singh's contention that he was being forced to pay out of his own pocket for his medical treatment, MoD said his ECHS (ex-servicemen health insurance scheme) smart card had also been dispatched to the Zila Sainik Board in Haryana's Jhajjar district on October 5 for being handed over to him. "Singh applied for the ECHS only on June 55 this year. His registration number was given to him in September to ensure he could avail of the facilities and now the card has also been issued," said the officer. 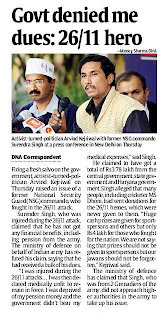 New Delhi: The Indian Army said on Thursday that claims by former National Security Guard (NSG) commando Naik Surender Singh of not receiving bulk of his dues was not correct. 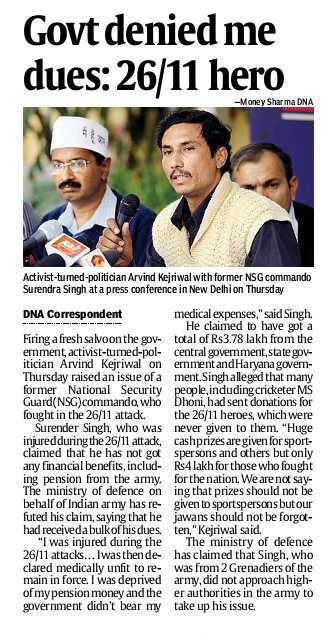 According to CNN-IBN, the Ministry of Defence in a press release said that Surender Singh had received bulk of his dues and had been paid Provident Fund of Rs 6.48 lakh, group insurance of Rs 1.18 lakh and disability pension of Rs 10 lakh. In addition to this Surender would also receive the final statement of accounts of Rs 89,000 and commutation of Rs 9 lakh in a month. Singh's monthly pension has also gone up Rs 25,000 because of his disability, as per the press release. The Ministry added that the former commando did not write to AG office or the Army Chief's office regarding his grievances. "Nk Surender Singh has been sanctioned pensionary and terminal benefits viz-a-viz retirement gratuity Rs 2,11,458/-, Commutation of pension Rs 11,35,809/-, Armed Forces PF Rs 6,48,195/-, Army Group Insurance Rs 1,13,849/- and Army Group Disability Cover Rs 10 lakhs, Final settlement of accounts Rs 89,705/- and ex-gratia from welfare fund Rs 10,000/-. He is also entitled to an ex-gratia compensation of Rs 9 lakhs for 100 per cent disability which will be processed separately. He has been sanctioned a pension of Rs.25,254/- per month which includes service elements and war injury elements," the press release said. BELGAUM: The joint military training exercises betweenthe Indian Army and Maldives National Defence Force (MNDF) have begun at the Maratha Light Infantry Regimental Centre.The training that began onNovember 12 is aimed at enhancing military ties between the two nations. The training is named as 'EKUVERIN-2012'. Maratha Light Infantry Regimental Training Centre, which is well knownfor its training centres across the world, is attractive for its infrastructural facilities. Most of the foreign armies prefer this training centre because of its facilities anduniqueness. A total of 45 army personnel from India and equal number from Maldives are taking part inthe joint training exercise. The bilateral annual exercises commenced in 2009 and are held alternately in India and Maldives. The aim of the exercise is to enhance theclose military co-operation between both the countries. During the joint training, the army personnel will undergo round the clock training. Apart from drills, they will undergo counter insurgency operation training. According to officials, the jungle camp atthe training centre gives the actual feeling for the army personnel. The training will conclude on November 25. "The centre is attractive because of its facilities here. We have jungle lane shooting which gives the actual feeling for the army personnel. The infrastructure is also goodin MLIRC that is why many foreign acountries prefer this training centre" addedMLIRC Commandant SantoshKurup. The regimental centre hereis carrying out its task of providing training to recruits in the use of smallarms - rifle, carbine, LMG- which are basic arms of the infantry. It has requisite administrative and training facilities including modified firing range, battle area, grenade firing area, demo area, jungle lane shooting and exercise area. Every year nearly 1,000 soldiersare trained from this centre. 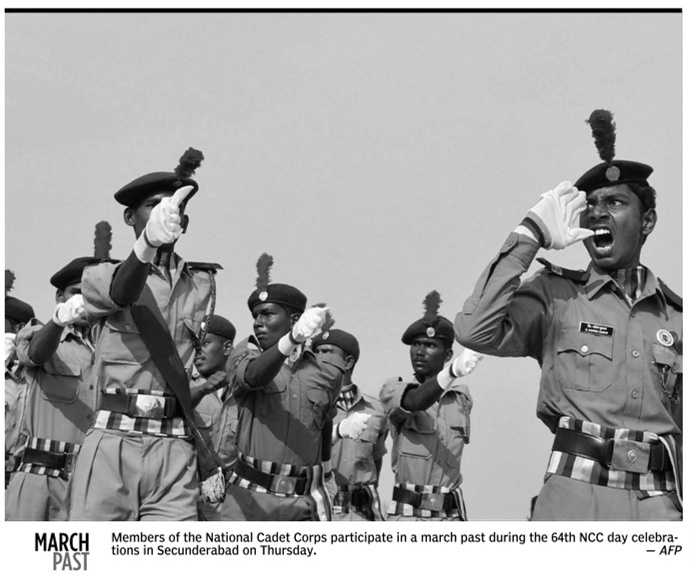 Thousands of students and National Cadet Corps (NCC) cadets visited the army expo in the city on Thursday. 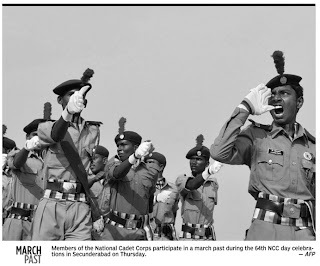 The army had displayed the infantry weapons at Sector 5, Panchkula. The weapons that were displayed include T- 90 tanks, BMP, Bofors Gun, Shilka weapon system and other anti air craft guns. The show kicked off with a performance by an Army band. This was the third day of a youth outreach programme organised by Western Command . Earlier the show was conducted within Chandimandir military station for two consecutive days. Major General RG Krishnan, along with other senior officers of Western Command, interacted with the students. 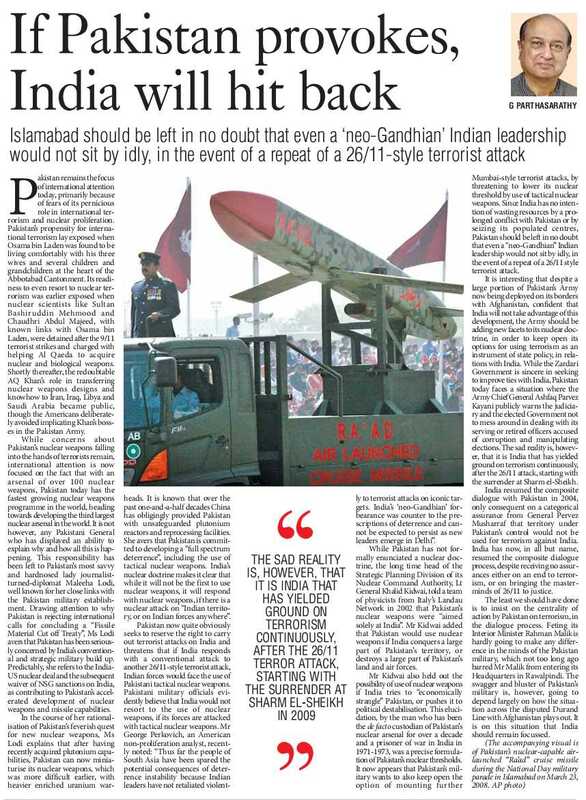 Army officials said that the display was put up to attract the youth towards the Army. “The students who had come to the expo gathered knowledge on career opportunities and recruitment procedures in the Indian army. 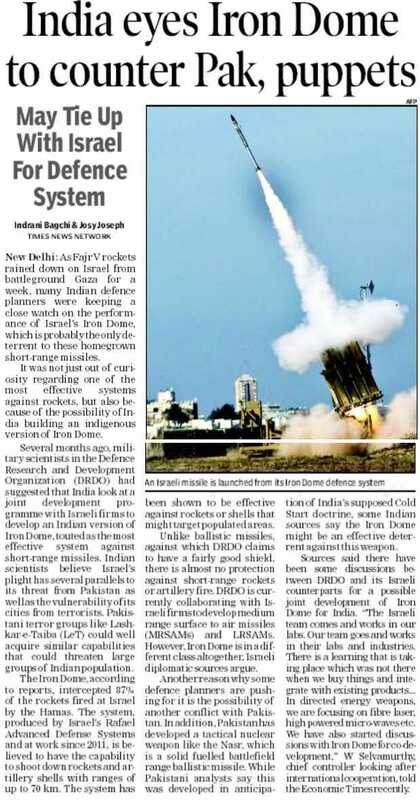 ,” said a Defence spokesman. The Army is also holding displays at Chandigarh and Mohali on Saturday and Monday.